I was in beautiful Vancouver, British Columbia not only for my good friend bboy Puzzles wedding, but also for his crew’s — ‘Supernaturalz’ 25th Anniversary which doubled up as a pre-wedding party the night before. 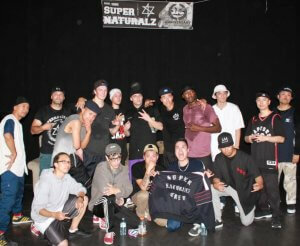 I was really excited to be able to make this as Supernaturalz (SNC) are an iconic crew who signature footwork and thread styles put them on the map for originality as world leaders in bboying. Founded in 1992, one of Toronto’s oldest active bboy crews, they have been dedicated to passing down the dance knowledge to future generations, 7 generations in fact. I’ve seen many crews disband over time so for a crew to reach 25 years together and celebrate still be able to inspire and even smoke young bboys was a very special occasion. In the spirit of celebration, Dyzee (Lead of SNC) had, ‘called out’ ‘Now or Never’ (NON) Crew from Vancouver over social media to a cypher battle. In all honestly I knew very little about this crew in advance of the call out but they seemed to be well known by my US and Canadian friends I could only imagine their level was high if SNC were calling them out and I knew this was a pivotal event in history, I knew it was an honor to be here and a lot of my friends wanted to see this for themselves but were unable to make it so I was really looking forward to it. Now or Never crew formed in 1996 originally known as, ‘No Other Name’ but changed their name to symbolize re-birth to, ‘Now Or Never’ when new bboys emerged in the crew during 2002. They had also celebrated their 15 year anniversary a few days ago. Both crews had longevity and now it was time to see them battle each other. I knew SNC members now lived in different countries and even scattered across different continents so they rarely all got together but it was even more rare to now see them all battle together, so I knew this was going to be a hype party, even more so it was going to be a family reunion. I was excited and I knew I was very lucky to be here to witness this first hand, there was going to be a live stream but the battle would not be recorded and shared online, which made it even more special. It was also my first time experiencing a bboy event in Canada, having been to several in Europe and Asia I was very interested to feel the difference in vibe. It was a bock party with a BBQ, cyphers and a outdoor bar area, in the blazing sunshine, with live graffiti. I really liked the feel of this, all the diverse elements of hip hop being there. There was a cypher as the music got started with DJ Bles One on the decks playing the best hip hop, breaks and party jams it was just the right balance of everything, people just wanted to dance and have a good time, there was a really nice vibe, a young child kept getting down with the older bboys and then they saw a girl waacking on the side and invited her into the cypher, someone even got down with locking, it was refreshing for me, any styles welcome as long as you were having a good time, it wasn’t just about bboys. Then all of a sudden, Bridge of SNC came out of nowhere, I haven’t seen him since Hip Op Session France in 2009 but he was as fresh as ever, he threw down in the cypher and pointed to members of NON, people started to make noise and get hyped, Dyzee announced on the mic the battle had begun and it was on!!! Everyone rushed to form a tight packed circle around the two crews, trying to get the best spot to see from, it was a really spontaneous moment. Dyz handed the mic over and joined his crew on the battle line. This wasn’t a competition, there were no judges, it was a straight up raw cypher battle with no time limit and it meant everything, it was bboying in it’s purest form. The atmosphere was electric. NON came out strong, they had a lot of style and flava, but then SNC came out equally as strong if not stronger towards the end, there was so much energy in the battle, everyone was giving it 100% it lasted a total of 55 minutes but it did not feel like that long at all, I wished it could have gone on longer!! It was like an adrenaline rush to watch. There were inventive go downs, sharp freezes, flips and it would break into up rock battles mid way and of course the most mind boggling threads and intricate footwork that was super clean! There was just the right level of aggression between the two crews, for competitiveness but not in a disrespectful way, it was refreshing to see. NON came out strong, with a crew routine, Dyzee and Puzzles replied with their own routine, I remember being with them at Circle Industry in Austria when they won with this same routine in 2012, it was fresh then and it was still fresh now. Nostalgia hit me hard. As sudden as it had started it was all over. After the battle it was all love, hugs were exchanged between both crews and Puzzles graced the mic to make the announcement to clarify SNC only called out NON because they respected them. To me this was what hip hop is all about. Luckily Doy from Stance was in the building filming for a trailer which I cannot wait to see, it was the kind of battle your mind does not fully comprehend on the first watch. Dyzee gave his speech about the generations of SNC crew introducing each member, he said some heartfelt words about Puzzles, how they had met and how much they had been through together, you could instantly feel they had been friends for life, one thing that was very apparent to me with both of these crews was that they were real friends. Dyzee has a real way with words, I can’t imagine anyone else getting away with giving a speech at a bboy event, but when he speaks everyone is encompassed by his words of wisdom. The ciphers started again. I saw someone getting down in a white Toronto Maple Leaves hockey shirt, I recognized that style, it was of course Antics, I hadn’t seen him for a long time either, the last time was in Korea and he was killing the cyphers. As he stepped out I went to say hello, but I could see he was eager to get back to throwing down, it was nice to observe such hunger and passion to just get down. Next up there was a, ‘Go down battle’ to see who had the best get downs, then the rest of the night was about having fun. There was a great party / family vibe, many people including myself had traveled across the globe to be there so we all just wanted to have fun and enjoy each other’s company. I met a lot of very cool people, we spent hours talking about music and culture from DJing to graffiti and the history of New York and its influence all the way to Australia, I really enjoyed myself among real hip hop heads. A big congratulations to both NON and SNC for your crew anniversaries and to Savio ‘Puzzles’ Suen and Jennifer Nguyen on your wedding!